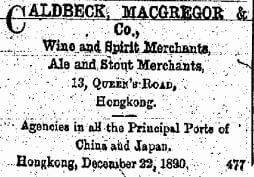 “The firm of Messrs. Caldbeck, Macgregor & Co., established in 1864, is the largest and best known in the wine and spirit trade in the East. The headquarters are in Rangoon Street, Crutched Friars, London, and there are branches in Glasgow, Shanghai, Hongkong, Singapore, and Tientsin; whilst agencies have been established at Port Arthur, Chefoo, Weihaiwei, Kiaochau, Hankow, Foochow, Taiwan, Canton, Macao, the Philippines, British North Borneo, and Penang. 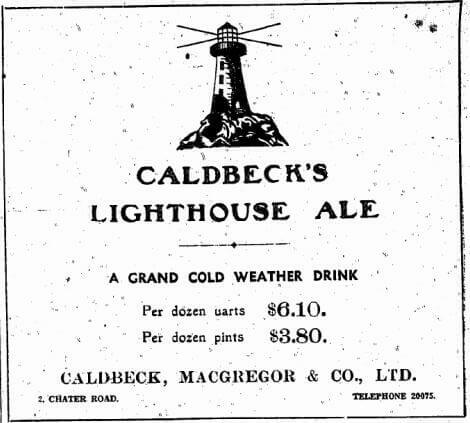 The Hongkong branch, which was opened in 1889 [another source says 1890], is managed by Mr. C. J. Lafrentz, one of the managing partners of the firm; whilst Mr. Frank Lammert is assistant manager and signs per pro. Messrs. A. G. da Rocha, and C. J. M. Pereira are assistants, and there is a large staff of men engaged in the godowns and in the bottling department, which latter is under the charge of Europeans. An extensive trade is done with the army and navy, with the numerous local clubs and hotels, and with the leading residents of the Colony. 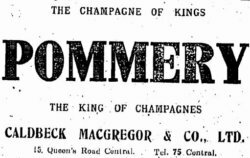 Over a hundred and fifty British men-of-war have been supplied by the firm since 1878, and about fifty military messes have dealt with the firm since 1890. Nearly a hundred United States warships also appear on the list of patrons. This article was first posted on 7th June 2017. Wright, Arnold, : Twentieth Century Impressions of Hongkong, Shanghai, and Other Treaty Ports of China: Their History. People, Commerce, Industries, and Resources. London: Lloyd’s Greater Britain Publishing Company, Ltd., 1908. SOLE DISTRIBUTORS CALDBECK MACGREGOR (HONG KONG) LTD. I was wondering if you would be able to tell me the age and alchol percentage might be? It apooears to be quite old.